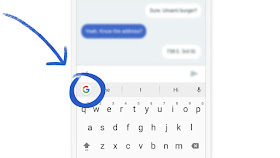 If you have always wanted a very light, customizable and totally free keyboard app for your android smartphone then you can't go wrong with Google Keyboard (Gboard). Aside being free and easy to customise, Gboard actually offers some cool and unique features that you won't find on other android keyboard apps such as one handed mod, built in search bar, inbuilt GIFs search option and many more. Google has just released another update for the Gboard app which now adds support for more languages, so now you will be able to use up to 120 languages on your Gboard app. Also, all Gboard users will now get access to four sticker packs by default (previously Gboard only included stickers if Google's Allo messaging app was installed). For those who are already using Gboard app, just head over to PlayStore and update or if you are yet to try out the app, you can also download it to enjoy the above mentioned features and more such as GIFs, emoji-centric tools (including type and scrawl to search), and also voice typing. Download Gboard App on Playstore or HERE.